Community Involvement | "Welcome Buddies"
Though this website highlights the contributions of Sarasota’s Great War veterans, those who enlisted were not the only heroes of the Allied cause. Despite the numerous reasons which prevented most of the citizenry from participating in battle, many of the townspeople still wanted to help. This section presents just a few of the ways those on the homefront supported the war effort. At the beginning of the United States’ involvement in the Great War, the armed forces needed supplies. This need, plus a citizenry eager to help however they could, created a perfect opportunity for the navy to obtain a useful tool: by borrowing binoculars from the public. The national call came with the promise to return the binoculars at the end of the war along with one dollar.1 It was a great deal, and some Sarasotans took note. Fig. 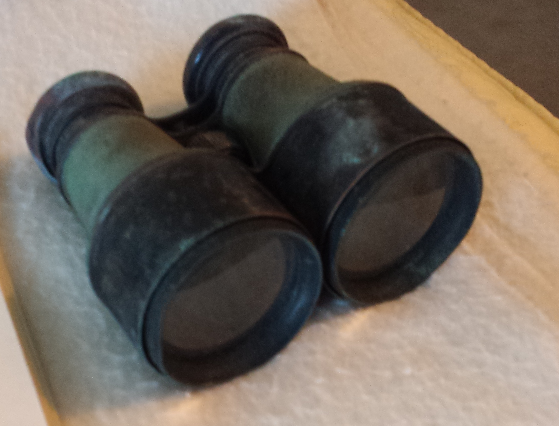 1 Owen Burns’ donated binoculars. According to his daughter Harriet Burns Stieff, the above binoculars were donated by Owen Burns to the Navy and successfully returned after the war. It is impossible to tell how much of the wear and tear is due to age and how much is due to use during battle. Regardless, the binoculars represent a great way those who could not enlist, in Sarasota and around the nation, contributed to the Allied cause. On May 30, 1918, President Wilson called on the nation to prayer for the Allies. This is mentioned in the diary of Ann Hall. In addition to this day, on June 20, 1918, the Sarasota-Times front page included a note from Sarasota’s mayor, G. W. Franklin, asking for a daily minute of prayer at 6:00 P.M. by all Sarasota Christians. The full note is pictured below. Fig. 2 Sarasota-Times, June 20, 1918. For some, the best way to help was to increase morale at home. Or, at least, that was probably the logic behind the War Party reported on June 27, 1918 (see below). Perhaps many of these young ladies were missing loved ones serving overseas and felt that a little fun was necessary. Fig. 3 Sarasota-Times, June 27, 1918. The local paper also hoped to boost morale by recognizing Sarasota’s soldiers and sailors. Fig. 4 Sarasota-Times, January 3, 1918. Spearheaded by Clara Barton as an adaptation of the goals of the International Red Cross Movement, by 1908, the American Red Cross was fully developed to provide “international civilian relief on behalf of the United States.”2 According to historian Julia F. Irwin, when President Wilson declared war on Germany, he announced that the Red Cross would “be our instrument to do the work of alleviation and of mercy which will attend this struggle.”3 The President echoed earlier calls by President Taft to the public to get involved in their local Red Cross Societies. The onslaught of an international war effort inspired many to contribute. In Sarasota, the diary of Ann Hall records her participation in Sarasota’s chapter. Throughout the Great War, the Sarasota-Times published both summonses for help and reports of the local Society’s efforts. Fig. 1. “Owen Burns’ WWI Binoculars,” digital photograph, taken by Joy Feagan with permission of Harriet Burns Stieff, Sarasota, Florida. Fig. 2. “Notice To The Public,” Sarasota-Times, June 20, 1918, courtesy of Sarasota County Historical Resources, Sarasota, Florida. Fig. 3. 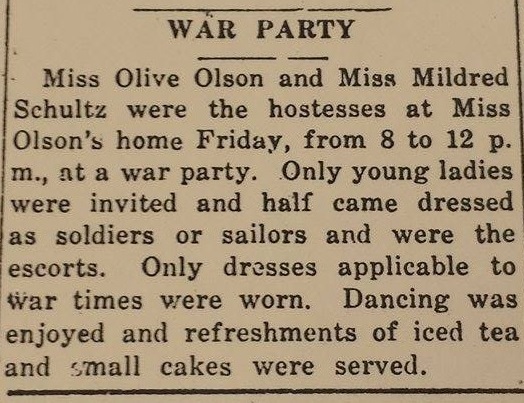 “War Party,” Sarasota-Times, June 27, 1918, courtesy of Sarasota County Historical Resources, Sarasota, Florida. Fig. 4. 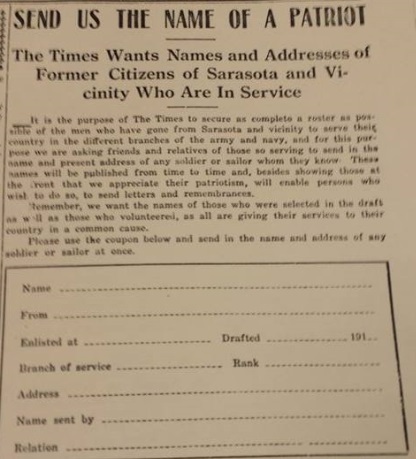 “Send Us The Name Of A Patriot,” Sarasota-Times, January 3, 1918, courtesy of Sarasota County Historical Resources, Sarasota, Florida. Julia F. Irwin, Making the World Safe (Oxford: Oxford University Press, 2013), 34. “Our Sarasota Red Cross,” Sarasota-Times, January 3, 1918. “Sarasota Will ‘Go Over’ Again,” Sarasota-Times, July 18, 1918.